Mohali, one of the most meticulously planned cities of North India is witnessing further infrastructural developments after being clubbed with Chandigarh under the metro city concept. Right from IT parks to research centers to educational hubs, all kinds of state-of-the art projects are being launched here. These developments have attracted a huge urbane populace into the city which in turn has boosted the real estate market of Mohali. There is especially a huge demand for residential properties within gated communities in this city. Gated communities are, in essence, premium residential projects that are especially designed, planned and constructed, keeping the privacy and safety concerns of the residents in mind. Gated communities offer a number of very important advantages, facilities and conveniences. As a result, the young population settling down here is very keen on buying 3 or 2 BHK flats within gated complexes in Mohali. 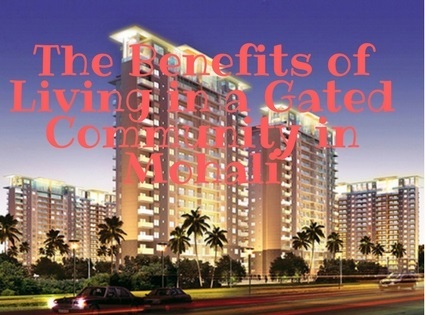 Some of the major advantages of living in a gated community have been listed below. · Higher security: One of the most important benefits offered by gated communities has to do with better safety and security features. Unwanted intruders rarely have a chance to enter these projects, as access is strictly limited to the residents and their guests. The constant presence of security personnel and high-tech surveillance equipment serve as excellent deterrents for intruders, burglars and other antisocial elements. · Controlled access: An outsider visiting a gated community must have an access code or some other identification method in order to be granted access. The visitor must know someone living within the community and thereby enter the premises as their guest. In this way, an accurate record of the comings and goings of each visitor is maintained. This system of restricted entry ensures a safe and secure environment for the residents. · Vehicle speed: Speeding vehicles cause major problems in most residential neighborhoods and localities. Such vehicles can lead to accidents and make the area dangerous for children and elderly people. In gated communities, however, the vehicles of visitors have to be parked outside the premises. Residents too are required to drive slowly once they enter the premises of the gated community. · Pedestrian safety: The exceptional security features and lower vehicle speed found inside gated communities guarantee better security and safety for pedestrians. Therefore, people living inside gated communities can take a walk around the premises, go out jogging, and take their pets or children out to play without any risk of accidents or mishaps. It is only in gated communities that people get to enjoy such convenience which further justifies the huge demand for 2 bhk flats in Mohali.